The Lenovo 730 runs on Windows 10 Home Edition. The laptop features a 13 inch,UHD IPS MULTI-TOUCH,1920 x 1080 pixel and is powered by a Intel Corei7 8th Gen,2.7 GHz with Turbo Boost Upto 3.5 GHz processor. To enhance multi-tasking and fast speed, the company has offered a 8 GB DDR4 RAM. Talking about the storage, the laptop uses a 512 SSD storage.There is a Bluetooth,Light Weight,Quick Charging,Wi-Fi and more.The laptop has a 4 Cell battery that will give enough battery life to the users. 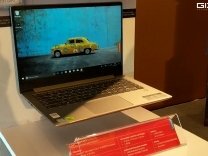 Lenovo has unveiled two new laptops under its Yoga series at the ongoing MWC 2018. Dubbed as Yoga 730 and Yoga 530, the laptops are upgraded versions of their respected predecessors and will be available starting from April. The most significant addition in the two laptops is the support for Alexa voice assistant.